In a Nutshell: Valuation and strategy firm Brand Finance studied the much-foretold downturn of traditional brick-and-mortar retail and found that the prospects weren’t nearly as grim as once thought — especially for consumers. Amazon’s recent push beyond digital into physical retail operations demonstrates that brick-and-mortar locations still play an important role in the market. And retailers will likely take new approaches to consumer marketing and sales that are designed to compete against online brands. Brand Finance expects those strategies to include faster transactions, better incentives, improved customer service, and a showroom-style approach that allows customers to experience products before buying. One Friday afternoon, I went to Home Depot to get a spool of line for my weed trimmer. True to form, I forgot to check what gauge I needed, but a helpful employee directed me to the right product. On my way past the garden section, I noticed Adirondack chairs were on sale. I sat in one; I liked it, and I decided to get two. I breezed through self-checkout and, all told, was in and out of the store in less than 15 minutes. I was ready to tackle my yard work later that afternoon, then spend the next two days sitting outside, enjoying the sun and the warm weekend breeze. Ease, knowledgeable assistance, speed, and instant gratification — these are the biggest reasons Home Depot has solidified its position as the fourth most-valuable retail brand in the world while other big-name stores struggle. Amazon is currently the most valuable retail brand on the planet and is evidence of the shift toward digital shopping. That trend is explored in “The Death of High Street,” a report issued by the independent valuation and strategy firm Brand Finance. As online retailers continue to gain ground — and brick-and-mortar brands seemingly flounder — shoppers may wonder what they can expect for the 2018 holiday shopping season. Laurence Newell, Brand Finance’s Managing Director of the Americas, said brands should use both digital and physical channels. Beyond opening Amazon Books and Amazon Go — which sell books and groceries, respectively — Amazon also recently acquired Whole Foods. Any consumer can stop at a Whole Foods for a gallon of milk or a loaf of bread, but the chain now offers perks for Amazon Prime members: Two-hour delivery, 5% back on purchases, and additional discounts on sale items and best-sellers. These maneuvers affirm that the world of retail won’t be going entirely digital — at least, not anytime soon. Instead, brands like Amazon and Home Depot are adopting a hybrid model that leverages the strengths of both online and brick-and-mortar retail. Foremost among those strategies are ease of purchase, solidifying brand loyalty, enhancing customer experience, and leveraging physical retail space to appeal to consumers through product experience. By keeping a footprint in both the physical and online spaces, retailers can employ these new strategies to appeal to a wider consumer base. Online shoppers are familiar with this tactic by now. It’s the principle behind Amazon’s one-click purchase button and eBay’s Buy It Now feature. Retailers, like Home Depot, Walmart, and Best Buy are keeping pace by allowing consumers to purchase items online and pick them up in-store. Home Depot’s self-checkout is another example of making the purchasing experience easier. Amazon Go takes it a step further with dynamic, in-store monitoring that relies on data from cameras and a mobile app. The result: customers can walk in, pick up an item, and walk out; their accounts are billed automatically with no checkout required. Most of the top international brands are combining online sales with a brick-and-mortar presence. But once consumers leave, they still need to have a good reason to return. “Remind me that I want to do this again and again — and that reminder, basically, is called loyalty,” Newell said. Rewards and incentives can go a long way in encouraging consumers to stick with a brand. In addition to gaining repeat customers, this strategy also provides an important emotional appeal: getting more value than they’re giving. But there’s more to customer service than just sales. Consumers want their questions answered and their problems resolved. When brand representatives are knowledgeable, courteous, and helpful, the customer feels valued. This makes them more likely to bring their business back to that brand. Retailers like Home Depot are stocking their floor space with products that are more likely to require expert consultation. Even when picking up online purchases in the store, customers can still speak to a representative if they have any questions or concerns. Those service strategies can transform retail shopping into a positive customer experience and go a long way toward earning business. But physical locations also have one experiential advantage customers can’t get online: product interaction. Sometimes, a customer just wants to see a product in person. You can preview a book online, but you can’t flip through it — or be enticed with that new-book smell. In a store, you can see how a garment fits, feels, and looks when worn; or you can place your hands on the keyboard of a new laptop. The in-store, showroom-style experience is still highly valuable to consumers, and the product experience can motivate customers to buy. That’s another reason why the physical store is still a coveted channel for retailers. Digital retail’s low overhead has traditionally been viewed as a distinct advantage over physical retail space. However, the cost of maintaining a brick-and-mortar store is still well worth it, as Amazon is demonstrating. By employing the showroom retail model, brands can increase their value per square foot rather than trying to raise it by increasing total square footage. Customers feel more gratified when they walk out of a store with a physical product. They don’t have to wait around for it to be delivered, and they get to open the package and enjoy it right away. 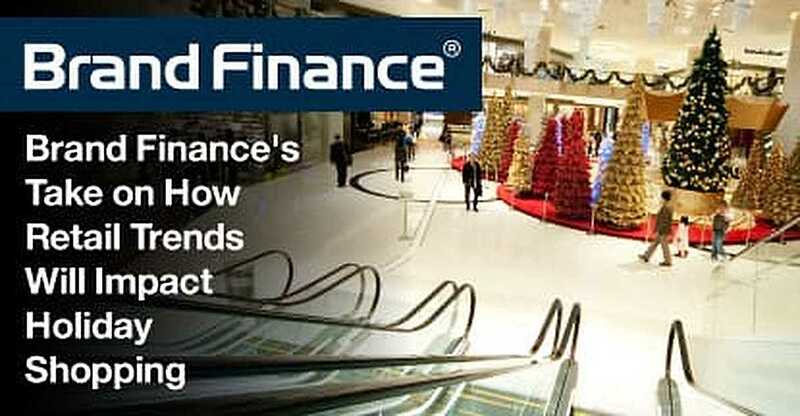 In Brand Finance’s final analysis, it seems offline shoppers won’t have to worry about boarded-up malls and bare aisles this holiday season. However, the traditional brick-and-mortar shopping experience will need to continue its evolution to maintain its market share. Under this new paradigm, consumers may see online retailers moving more aggressively into brick-and-mortar locations, while traditional brick-and-mortar stores shore up their online presence and functionality and adopt a showroom-style model. And both will strive to improve the incentives they offer, the ease of purchase, and the consumer experience.